Discussion in 'Car and Track Knowledge Base' started by Thomas Jansen, Apr 9, 2019. The first car has been one of my personal favourite cars in the game for a while now, the Porsche 911 GT3 Cup is definitely a very underrated car. This most likely comes from the 'GT3' tag it has, while it has almost no downforce compared to GT3 cars. As it's a cup car, it's quite locked down in terms of setup, making it fairly simple to tune without getting lost. You can still make a big difference on the handling though! The default setup is already a very good baseline, thanks to @Alex Hodgkinson 's awesome work, which is why I have only made some small changes to get the balance more to my liking and improve tire temperatures. Usually the first setting I change on any car, the brake bias is extremely important on cars without ABS such as this Porsche. Even more so when flatspots come into play in the future. Luckily, it is quite an easy setting to tweak and can even be done while driving. It is very driver dependent what setting you end up on, but there is definitely an optimal range. In general, you want to shift the brake bias to the rear, until you find the point where you lock up the rears before the fronts and choose a setting just above that. Which setting you choose exactly is mostly determined by how safe you want to be and how much you trust your braking foot. A new addition to the RaceRoom setups, but a crucial one to get right. Telemetry is a must to get this perfect and it makes it quite simple to tune, but in general you will end up with a bit more pressure in the 'more loaded' side of the car, which will be the left side on most tracks. A bit lower pressure in the least loaded tires helps keep up the temperature in these tires, which definitely helps in this Porsche, which almost lifts its inside front wheel off the ground in a lot of corners. With telemetry, you want to aim for the middle tire temperature to be right in between the outer and inner tire temperatures. In the right operating range, higher pressure will increase the middle temperature and vice versa. Generally you can assume that the default pressures already get you quite close to this ideal point and you can tune it to suit a specific track. Silverstone puts a lot of load on the left side tires, with corners like Abbey, Copse, Stowe and Club. This can create a massive difference in tire temperatures between left and right, up to 30c was quite common in the Porsche. This is why I ended up with a bit lower pressures in the right side tires, while increasing the rear left pressure slightly. The rear wing was often a big point of frustration for me on older physics, GT3 in particular, as it not only had a massive impact on top speed, but also just made the car understeer to nowhere. This is definitely fixed as this Porsche and other updated cars are very nice on their default wing settings, so nice that I even added more wing on this setup! The effect of the wing is quite straightforward ofcourse, but hugely important. Combined with the suspension options it gives you a nice tool to alter the balance at high and low speed separately, which is exactly what I used it for on this car. As I felt that the main bottleneck for the car was rear end grip at high speed, the car would get too loose very easily in Maggots & Becketts for example. On the opposite side at low speed the car is very planted and controlled, so there was some room to set the suspension up a bit more balanced towards the front and adding wing to make the balance more consistent between different parts of the track. The wing setting does have some effect on top speed, but this is really not an effect you should have to think about unless you are on tracks like Monza or Paul Ricard. Balance is the main point of interest here. Toe adjustments are all about adjusting the different slip angles tires are operating under. The general rule for 'normal' RWD cars is to have a bit of toe-out on the front and a bit of toe-in on the rear. As you can steer the front wheels to any slip angle you want, the toe mainly dictates the difference in slip angle between the two wheels and has a small effect on how the car reacts on initial turn-in. In my experience this effect is quite small, at least in RaceRoom, so I tend to leave the front toe-out on default and play with the rear toe-in value. As you don't steer the rear wheels, this toe value on the rear can have a large impact on how the tires are working, especially on power on corner exit. Too low toe-in or even toe-out on the rear will usually cause 'shopping trolley' handling and a tendency to overrotate on power. While too high toe-in values will make it feel very reluctant to turn on power. Keeping this in mind, I tend to use the rear toe-in as a nice balancing tool for how much the car wants to rotate on power out of corners. Though you have to be careful, as this is also affected by a lot of other setup tweaks, such as the rear anti-roll bar. As this is a proper Porsche with tons of rear traction, I felt some room to lower the rear toe-in to make the car a bit more willing to turn, which helps a lot in the slower corners such as Village and Luffield. The anti-roll bars dictate a large part of the balance of the suspension and is often an easy tool to alter the overall balance of the car. The general rule that applies when you are in the right operating range is softer = more grip, as it spreads the load between the inside and outside tire more evenly. So softening the front ARB will create more oversteer and softening the rear will create more understeer. However, this also has effects on other aspects, such as floor downforce, handling over curbs and responsiveness, so softer is not always better. As the ride height on this Porsche is quite high due to regulations, you can run the ARBs quite soft without any problems. 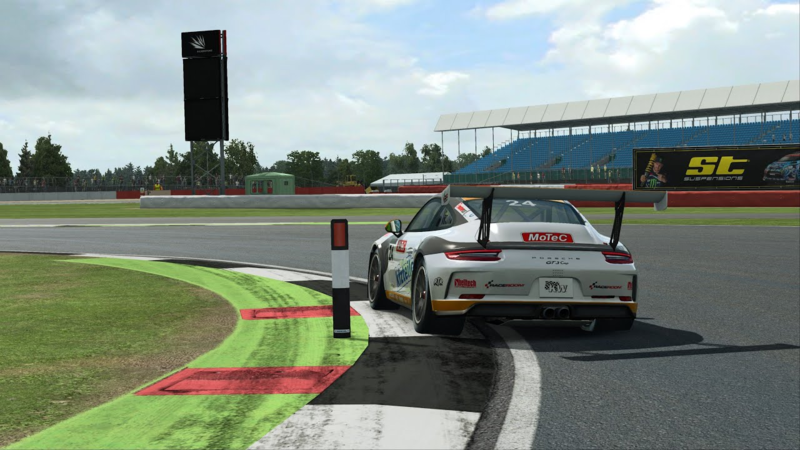 As I gained quite a bit of rear grip at high speed with the higher wing, the overall balance started leaning a bit to understeer, so I softened the front ARB by one click and immediately gained some laptime, so I lowered it further, which was better still. However, the last click came with a hint of that high speed oversteer again, so the optimal was somewhere in between those two settings. Luckily, the rear ARB has really fine settings on this car, so I could keep the lowest front ARB setting and balance it with one click down on the rear ARB too.